One doesn't have to work for long in most major corporations to realize that multi-tasking, juggling multiple priorities, and the ability to produce results in tight time frames are considered to be key success factors. Never mind that the fallout from this dysfunctional lifestyle is burnout and major health issues. The pressure to work longer and longer hours and be constantly available through mobile devices is another culprit that wreaks havoc with marriages and family life. Parents are too exhausted to be fully present and engage with their children after another late night at the office. It's just too high a price to pay for success... but it doesn't have to be this way. Arianna learned about the price of a fast-paced lifestyle and sleep deprivation the hard way when she came to in a pool of her own blood, after collapsing from sheer exhaustion. She injured her cheek bone and needed four stitches on her eye. She asked herself, "Is this what success looks like?" 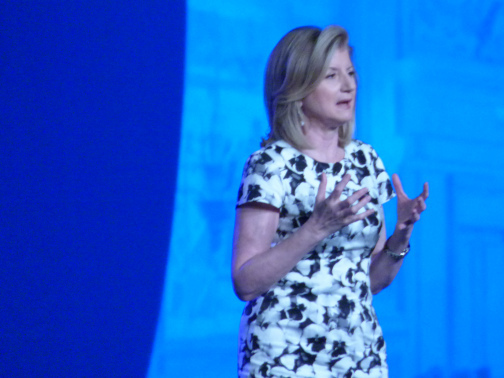 Now Arianna Huffington is sounding the alarm that "sleep deprivation is a national epidemic" America. Recently, she gave over 2,000 event industry professionals attending Cvent CONNECT at the MGM Grand Hotel a much needed wake-up call. Cvent CONNECT was a five-day conference produced by Cvent, a publicly held, cloud-based software company that specializes in meetings management technology. Arianna's message was not lost on the audience. In 2014, event coordinator was number five on CareerCast's list of the top 10 most stressful jobs. It was rated as being a more stressful career than senior corporate executive and police officer. They weren't the only ones. Public relations executives ranked sixth. The only occupations that were rated as more stressful were those involving life and death: airline pilot, fire-fighter, military general and, at number one, enlisted military personnel. There was a slight improvement in 2014 and event coordinator fell to number eight. Actor, broadcaster and photojournalist, and newspaper reporter also made the top 10 for 2015. Digital Detox: Disconnect from technology and re-connect with ourselves. Arianna stressed the importance of transitioning between work life, personal life and sleep. She advised individuals to power down all devices at a specific time every day. Other tips included discontinuing the practice of charging mobile devices beside your bed and checking emails every time you wake up. Sleep & Meditation: Set a regular time to retire every night. Turn down the temperature to improve the quality of sleep. Take power naps. (Individuals are more productive after a 20-minute nap than after a hit of caffeine or sugar.) Re-introduce prayer and devotions or meditation into your life. Gratitude: Enjoy the ordinary goodness of life. Forgiveness: Resentment saps energy while letting go of grudges is a gift we give to ourselves. The Divorce section of The Huffington Post offers strategies to help readers in this area. Mini-Life Audits: Be realistic. Identify the projects to which you can realistically commit. Drop everything else. "You can complete a project by dropping it." To get the best out of their people, organizations also need to discontinue the practice of enabling dysfunctional employee habits. "We need to stop congratulating people for working 24/7." When employees are walking around like zombies in a state of exhaustion they can't possible generate innovative solutions. Specific suggestions included encouraging employees to experiment and take more. In corporate cultures with a higher tolerance for failure, it is more likely that game changing ideas will be generated. North American corporations can learn valuable lessons from other companies including some in Europe that are trailblazers in the effort to promote employee health and well-being. Volkswagen: Volkswagen issues company mobiles that turn on at 7 AM and turn off at 6 PM so that employees can spend quality time with their families without interruption. Daimler AG: Daimler AG discourages employees from picking up email when they are on vacation. The absence alert provides a back up in contact in case of emergencies. It informs sender that the employee is on vacation, indicates the date of return and notifies them that the e-mail will be deleted. The Huffington Post: At its New York newsroom, a nap room is provided for employees to re-charge through power naps when they need them. Finally, for individuals and corporations, re-imagine what success looks like. Together, we can "overcome the collective delusion that burnout is the way to succeed." Anne Thornley-Brown is the President of Executive Oasis International, a Toronto based management consulting firm specializing in team building and executive retreats to help organizations survive, thrive and grow even in the midst of turbulence. For team building tips, follow Anne on Twitter @executiveoasis and like the Executive Oasis International Facebook Page.